Wall Street's big March rally is officially on hold after the White House rejected turnaround plans from General Motors Corp. and Chrysler and gave investors a reality check on the economy. Major indexes fell about 3 percent including the Dow Jones industrial average, which lost about 254 points but finished well off its lows. Financial stocks weighed heavily on the market amid worries that banks will need fresh injections of capital. Fears of an automaker bankruptcy have been looming over investors for months, and the latest developments, which included the removal of GM's CEO Rick Wagoner, made the market even more uneasy not only about the industry, but the overall economy. However analysts said the pullback, which began with a 148-point drop in the Dow Friday, wasn't surprising after the average surged 21 percent over just 13 days. The rally that began in early March was fed by economic and corporate reports that were starting to look more encouraging. Now, investors are taking money out of the market ahead of economic numbers this week and first-quarter earnings in the weeks ahead, fearing that disappointing data, including the government's March employment report on Friday, will set the market back. On Monday, President Barack Obama refused further long-term federal bailouts for GM and Chrysler, saying the companies needed to get more concessions from unions, creditors and others before the money could be approved. He also raised the possibility of controlled bankruptcy for one or both of the companies. While the restructuring will be painful in the short term, Mr. Obama said he is confident it "will mark not an end but a new beginning for a great American industry." In an interview with broadcast Sunday, Mr. Obama said the companies must do more to receive additional financial aid from the government. "We think we can have a successful U.S. auto industry. But it's got to be one that's realistically designed to weather this storm and to emerge - at the other end - much more lean, mean and competitive than it currently is," Mr. Obama told Face The Nation host Bob Schieffer. Underscoring the fear that the financial industry's troubles are far from over, Treasury Secretary Timothy Geithner said Sunday during a television interview that banks would likely need considerably more money. Also over the weekend, Spain was forced to bail out a bank for the first time since the financial crisis began. The Bank of Spain took control of a small savings bank and provided $12 billion in government funds to support it. Banks had been a driving force behind the market's rally in March and analysts now expect those shares to see some of the worst declines as investors become more conservative ahead of the first-quarter earnings reports coming up in the next few weeks. Bank of America Corp. fell 17.8 percent Monday and Citigroup fell 11.8 percent. Many market watchers had called the recent upturn a "bear market rally," or a temporary upturn within a bear market, defined as a 20 percent decline from a peak level. Rallies within bear markets can ratchet up big gains but also can easily come crashing down. "Twenty percent is a normal bear market rally," said Ron Weiner, president and chief executive of Westport, Conn.-based investment advisory firm RDM Financial. "Testing bottoms is a long-term process." With the economy still deeply troubled, some analysts say the market may have gotten ahead of itself. 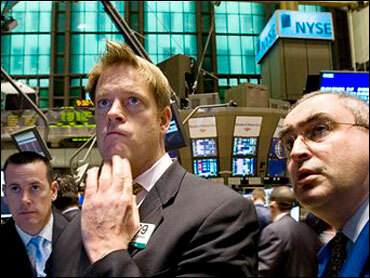 The Russell 2000 index of smaller companies dropped 13.03, or 3 percent, to 415.97.